Welcome to SlotV! We are happy to welcome every new player. And for you to quickly grow familiar with the casino, we have prepared some welcome gifts. The beginners are offered bonuses for the first three deposits, in addition to which you will receive up to 175 free spins for a great start to the game! Get bonuses and free spins and win! The minimum deposit in order to receive the first welcome bonus is 20 EUR (20 USD, 200 NOK, 200 SEK, 1000 RUB, 20 AUD, 100 PLN, 300 THB, 8000 KZT, 2500 JPY), to receive the second and the third bonus – 50 EUR (50 USD, 500 NOK, 500 SEK, 2500 RUB, 50 AUD, 250 PLN, 300 THB, 20000 KZT, 6000 JPY). The minimum deposit to receive free spins is 10 EUR (10 USD, 100 NOK, 100 SEK, 500 RUB, 15 AUD, 45 PLN, 300 THB, 4000 KZT, 1000 JPY). The maximum bonus for your first deposit is 100 EUR (100 USD, 1000 NOK, 1000 SEK, 5000 RUB, 100 AUD, 500 PLN, 5000 THB, 50000 KZT, 10000 JPY), for the second – 450 EUR (450 USD, 4500 NOK, 4500 SEK, 22500 RUB, 450 AUD, 2250 PLN, 22500 THB, 225000 KZT, 45000 JPY), for the third – 450 EUR (450 USD, 4500 NOK, 4500 SEK, 22500 RUB, 450 AUD, 2250 PLN, 22500 THB, 225000 KZT, 45000 JPY). The total bonus amount is 1000 EUR (1000 USD, 10000 NOK, 10000 SEK, 50000 RUB, 1000 AUD, 5000 PLN, 50000 THB, 500000 KZT, 100000 JPY). The second bonus can be used only after the wagering of the first, the third bonus – only after wagering of the second. 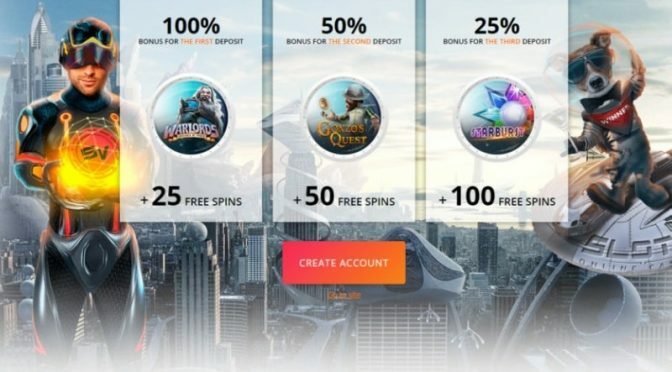 Free spins from the welcome package are available within 14 days after registration, the activation period for the welcome bonus is the following: 100% bonus – 3 days, 50% bonus – 5 days, 25% bonus – 7 days. Claim Bonus NowAnd Win Huge Today! Just Enjoy!